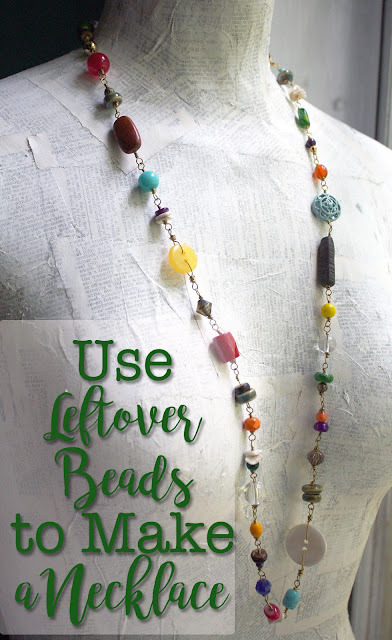 As a jewelry-designer, there's so much that goes into each piece of jewelry. There's the designing, making, photographing, and marketing. And, then there's the packaging of each item. For each designer, these processes vary to meet their brand and budget. Since I love to upcycle and never waste anything, I've long incorporated recycled materials into my packaging. Since my methods are simple, I thought it'd be worthwhile to share some of my methods. 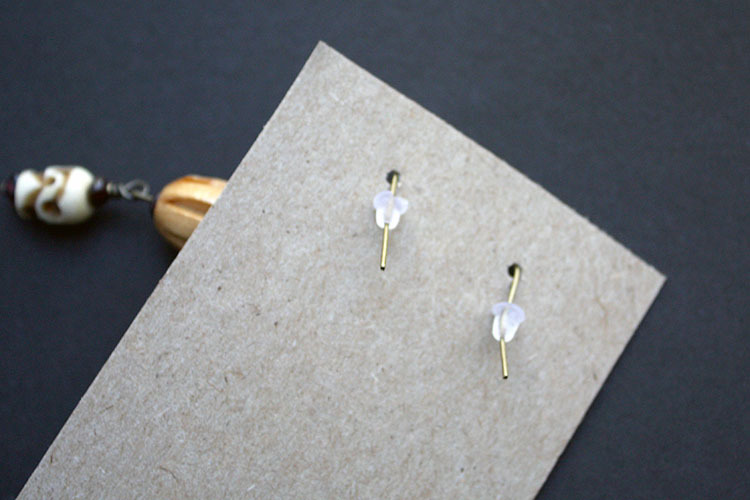 The most basic of these is the display card for a pair of fish-hook earrings. 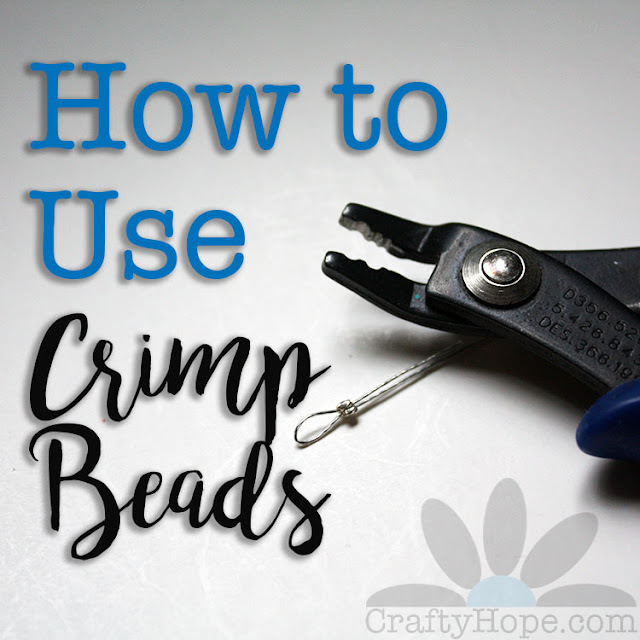 I use a simple backer for both displaying and shipping my earrings. The design of this card has changed over time to a simple whitewashed paper, but the method has stayed the same for many years. And, the materials are quite basic. 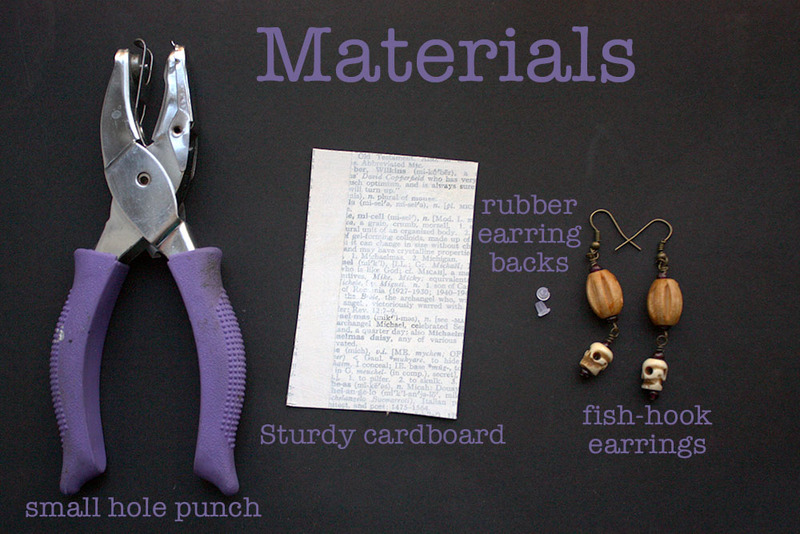 I use only a small hole punch, a rectangle of altered cardboard, rubber earring backs, and (of course) the earrings. The cardboard I use comes from saved cereal and cracker boxes. 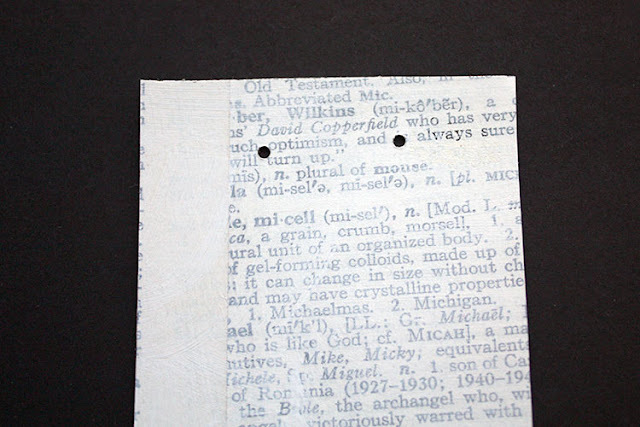 After I cut them down into panels, I paste on a layer of old dictionary paper then coat them with watered-down white paint or gesso. Once it's time to make a backer, I simply cut that down to the size I need based on the earrings. 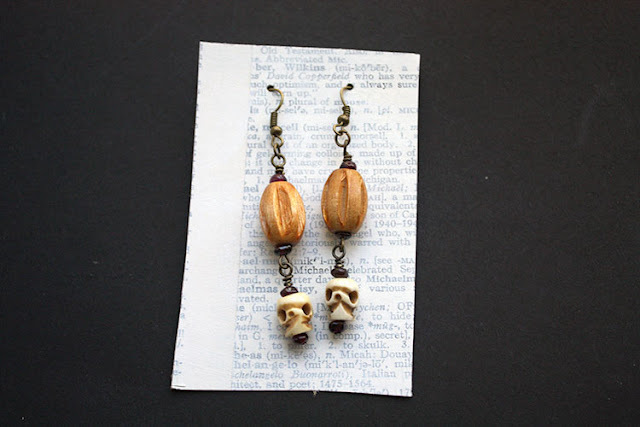 This ensures that the earring cards are never too small or too large. The hole punch I use makes a hole that is quite a bit smaller than a traditional hole punch. However, they're easy to find at most craft stores. I simply punch two holes at the top of the cardboard, spacing them to give each of the earrings room to be displayed. The fish-hook ear wires are inserted into the cardboard. See how snugly they fit? Rubber earring backs are placed on the ear wires to secure them on the card and ultimately for the use of the wearer. 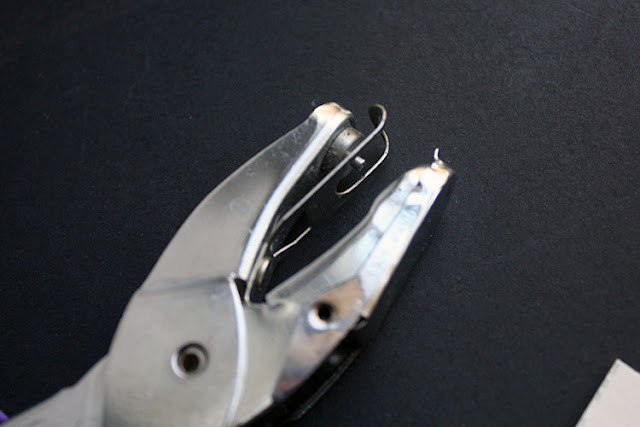 Using a regular hole punch would mean that the backers and the earrings might slip off the cardboard because of too large of a hole. And, that's it. This method is perfect for me because it allows me to recycle while injecting my own style on the backer. You might add whatever design you want on the cardboard: print something out, draw your own design, write a note to the recipient, etc. I like the whitewashed dictionary paper because it suits my vintage romantic style. 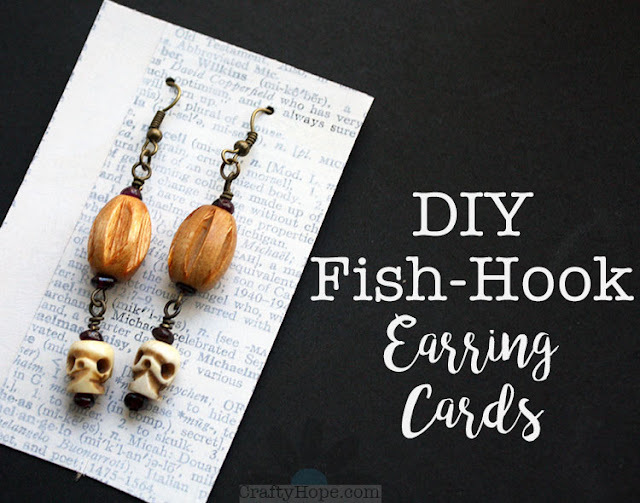 I did create a short video to quickly show you how easy these earrings cards are to make. Please don't hesitate to let me know if you have any questions. Now, go out there, make some earring cards, and save the planet! Great idea Hope! I love the result and customers! Customers really appreciate upcycled materials too. I am 100% with you. I strongly believe that packaging must be recycled in reused as well. 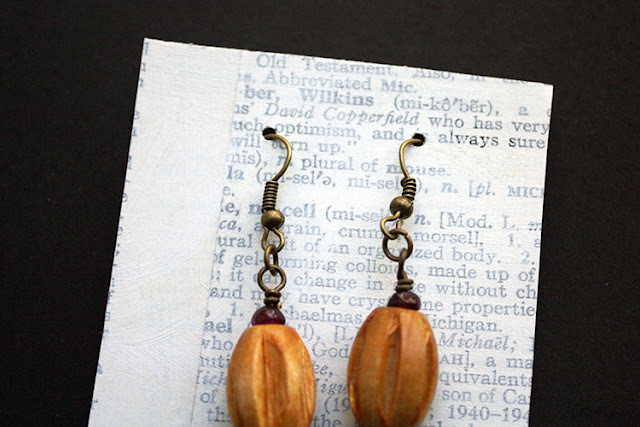 Off late I have been using jute strips for backing my earrings. All the bubble wrap that I get while shopping online is reused when I ship my pieces. Some people might find it tacky but I feel that its better for the world this way.